The fascinating album is devoted to a trio of 18th-century musicians who may be said without any exaggeration to have so exhausted the violin�s potential that their 19th-century spiritual successor, Nicol� Paganini, needed to do little more than consolidate that potential and refine the performer�s technique. 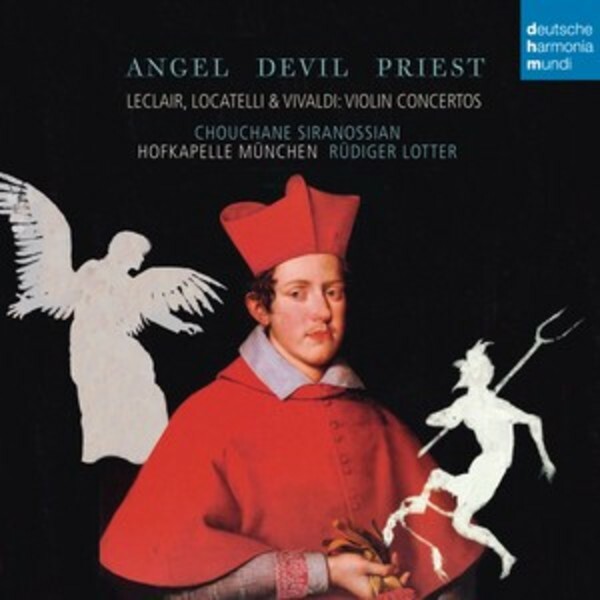 The musicians in question are Jean-Marie Leclair (the ANGEL), Pietro Locatelli (the DEVIL) and Antonio Vivaldi (the PRIEST). Leclair's Violin Concerto in G minor op.10 no.6 selected for this CD is the composer's last concerto for the instrument and at the same time the most demanding that he wrote for the violin. Also included are Leclair�s three 'Airs des d�mons' from his only opera Scylla et Glaucus, in which the use of different metres in the third 'Airs des d�mons' is particularly interesting, for this is a trick that Leclair uses to suggest that the demons are deliberately disrupting the rhythm of the number. No Italian violinist before Locatelli had produced such breath-taking effects on his instrument. Concerto no.7 no.6 ('Il pianto d�Arianna') that is included in this volume is an extraordinary piece from every point of view, starting with Locatelli�s use of the different keys, to say nothing of his treatment of the solo violin and even the concerto�s formal design. Vivaldi was dubbed 'the Red Priest' by his contemporaries on account not only of the colour of his hair but also because of the fact that he was ordained a priest at the age of twenty-five. The Double Violin Concerto in D minor RV514 that is featured in the present recording is one of Vivaldi�s most beautiful and at the same time technically demanding compositions.